Buying masks, lotions, and creams can put a strain on your budget! Plus, many times they expose your hair and skin to unnecessary chemicals and preservatives. 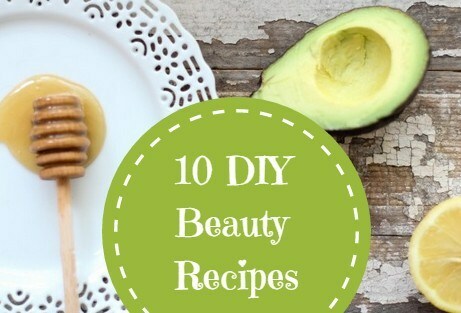 Check out these 10 DIY Beauty recipes for great, natural results without breaking the bank! P.S. Don’t forget to check out our other savings hacks on just about anything! Replace Face Wash With Skim Milk Powder~ This can make your face much softer and give you a smoother complexion. Plus, it’s also very gentle, so even the most sensitive types can use it. Moisturize Skin With Honey and Olive Oil~ Both of these two ingredients hold moisture really well and all you have to do is mix equal parts to create a pasty lotion. Rub it onto the dry skin and let it sit for 10-20 minutes before showering. Just rinse off- be sure not to use soap. Brown Sugar and Honey Facial Scrub~ Brown sugar exfoliates the skin cleaning the pores of all dirt, oil and dead skin cells and honey is naturally antibacterial. The combination scrubs away the junk clogging pores and cleans out the sources of the buildup to prevent future breakouts. Tone Skin With Avocados and Carrots~ Simply combine 1 avocado, 1 cooked carrot, 1/2 cup heavy cream, 1 egg and 3 tablespoons of honey. Leave on any part of your skin for 10-20 minutes and then rinse. These ingredients add a bunch of vitamins, antioxidants and calcium to rebuild natural collagen, tone skin and remove age spots. Coffee Grounds in Conditioner~ This one sounds weird and is only an option is you like the smell of coffee. Instead of throwing old coffee grounds away, toss them into your conditioner and is proven to make your hair extra shiny! Replace Conditioner with Vinegar or Baking Soda~ To get rid of build up and dullness, replace your conditioner with vinegar or baking soda 1-4 times a month – depending on your hair type. Just use it as you need it and you’ll be surprised how well it works to clarify your hair without harsh chemicals. Degrease Oily Hair With Lemons and Aloe~ Mix together 1 tablespoon of lemon juice and 1/2 teaspoon aloe vera. Add it to a normal serving of shampoo and it will get rid of your oiliness in your hair with one shower. Smooth Frizzy Hair With Honey~ Just add a tablespoon of honey to a liter of water and after shampooing, rinse your hair with this concoction to tame your frizz. Treat Chlorine-Damaged Hair~ This is so necessary after a long summer full of swimming! Mix together 1 egg, 2 tablespoons of olive oil and 1/4 cup of a peeled cucumber. Cover you hair with the mixture and leave it on for 10-20 minutes and your hair will be back to it’s healthy normal self in no time! Next articleParticipate in a New Skin Research Study!